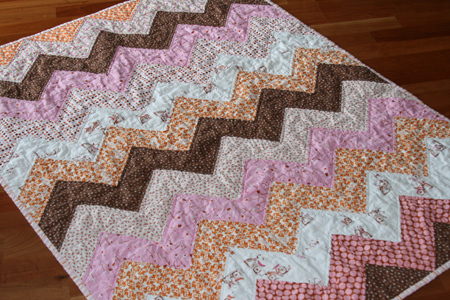 You may recall that the zig zag baby quilt was the first one I actually finished. It’s still one of my favorites, so I decided to do another, this time incorporating pink. 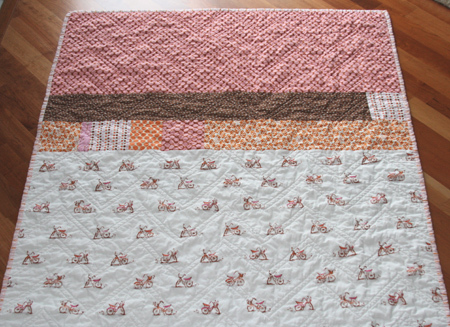 I added in some orange and brown prints, and the resulting quilt really reminds me of neapolitan ice cream. I’ve been trying to be better at actually using some of my favorite fabrics, so in this one you’ll see some of the Heather Ross bicycles I’ve been saving, as well as the light pink floral print. Since I still don’t know anyone having a baby, I think this one might end up for sale… providing I can part with it! 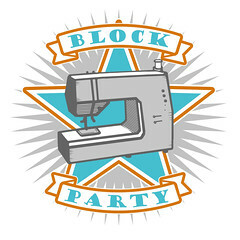 This entry was posted in [search] Zig Zag Quilts, 2009 Finished Quilts, Finished Quilts, Household Sewing - bags, napkins, pillows, Posts about Quilts, Quilts and tagged bicycles, handmade, Heather Ross, lightning bugs, quilt, quilting, zig zag. Bookmark the permalink. an out of control fabric stash! Oh so super cute!! I have those bikes in pink and it’s going to have to be a VERY special quilt that gets ’em!! what is the brown fabric you used? Kerri – I just checked on that for you. It’s by P&B Textiles – Alexandra by Alex Anderson. Daisies in chocolate… hope that helps! lovely! up for sale it should go…if only cause i’ll get to touch it all the time (with clean hands, of course). That is such a beautiful quilt. Your choice of fabric is always perfect. I have to ask, where do you find the time? It seems like you create a work of art every day! Very nice! Your colors work well together. It is great. I love the fabrics and the design you did. it was love at first site when i saw your first zigzag quilt, and i love this one so much too! i love your blog so much, and share it with everyone. because i think you bring a new age/modern meaning to the word “quilting”. i want to make a zigzag quilt with the new anna maria horner good folks fabric. would you mind sharing your pattern, or your triangle dimensions with me? So cute! I have to make a baby quilt this weekend and you’re seriously making me re-think my choice of pattern. it’s so cute – that bike print is one of my favorites. As always, I especially love the back. It totally reminds me of ice cream. I love the colours together. Very soothing and I love the back. Hi! I am new to your blog, but your lovely quilts have inspired me to start quilting myself. Do you sell your quilts on etsy? I have searched your blog but can’t seem to find that info anywhere. Thanks! I think this one is a keeper as well – it’s adorable! How deep is the “quilt chair” now? I’m sure there’s room for one more! it’s very cute! i love the colors! I love it!!!! 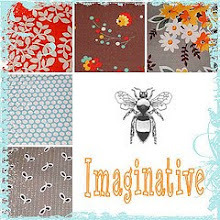 Great fabric mix! that is beautiful and looks so cozy! Awesome quilt, love the colors and zig-zags. The back is beautiful as well! This is just amazing!!! What a perfect color combo. Absolutely Gorgeous!! I love, love it!! It looks so yummy!! I have looked at this quilt on your blog many times. I just keep coming back to it! I love it! Would you be willing to help me figure out how much fabric to buy, to make one just like this?? I want this size. I would love any help you could give me. Thanks! !